Ohhhh, I've been a lazy blogger. It's been more than a month since my last post. We spent the first week of April at Disney World. (It was completely and utterly fabulous!) And I've pretty much spent the rest of the month recovering! Then my baby decided to go and turn 2 years old. (I don't remember giving her permission to do that!) So that was another big production. I'm pooped! ... But I'm slowly dragging myself back to normal. Anyway, here's a super tasty recipe that my kids went nuts over. (Afterall, who doesn't love meatballs?) The list of ingredients looks incredibly long, but don't let that scare you away. Many of them are basic spices and are used more than once in the recipe. To prepare the meatballs, preheat oven to 375 degrees. Whisk together the egg, rice milk and spices in a medium-sized bowl. Fold in the bread crumbs. Mix in the ground beef. (Don’t overmix! This will lead to tough meatballs!) Using a medium-sized cookie scoop, form the mixture into 18-20 meatballs, rolling the meatballs between your hands until they are smooth. Bake the meatballs on a cookie sheet coated with cooking spray or brushed with olive oil for 15-18 minutes, or until browned and cooked through. While the meatballs bake, prepare the salad. Toss together the cucumber, tomatoes and onion in a medium-sized bowl. Grab the dressing you prepared earlier and give it a good shake. Pour two-thirds of the dressing over the salad and stir together to combine. 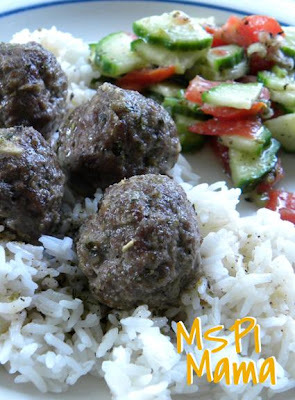 Serve meatballs over hot cooked rice, couscous or orzo. Drizzle with the remaining salad dressing. Serve salad on the side. Tip: If you don't want to use the oven, you can cook the meatballs on the stovetop. Just coat a frying pan with cooking spray or brush it with oil, then heat it over medium-high heat. Once hot, fry the meatballs for 10-12 minutes, or until done, flipping the meatballs every few minutes so they brown evenly. The all new MSPI Mama ... and a brownie, too! Creamy delights and a giveaway, too! This work by MSPI Mama is licensed under a Creative Commons Attribution-NonCommercial 3.0 Unported License. Please give proper credit if you use a photo or idea on your blog by linking back to the original post here at MSPI Mama.